*** This listing is for the carrying case only. No oils are included. Take your favorite Jade Bloom oils on the go with 10-bottle carrying case. This 10 Bottle Soft Essential Oil Carrying Case is perfect for your full size 10 ml and 5 ml bottles. The flexible dimensions of up to 2.75" x 6.5" x 2" inch is great for holding a mix of both sizes. I really like this 10 bottle carrying case. The webbing inside helps to see the labels on my roller bottles and inhalers. So far 10 seems to be the just the right size for me. LOVE THIS, PERFECT FIT FOR ON THE GO AND IN MY BAG. Perfect size for anyone on the go. Perfect carrying case for on the go. Oils nice and secure in separate pockets. Very cute and very attractive! I bought the purple one. Perfect to carry my "Must Haves" oils. Very handy. A great start up kit! I was so excited to receive this in the mail! All of the best and most popular essential oils all nestled in a perfect carrying case! Each bottle is securely stored in its own mesh pocket and the case easily folds together with a wrap around zipper. Every scent is so refreshing that I'm going to buy more as gifts! Great case for traveling to hold all of your essential oils mostly used! Do wish they had other colors to choose from than black, though. I love my cases!!! They are super easy to use and fit in my purse. I am able to separateu blends from my singles. I also love how durable they are. They are in my purse with the monsters, lol. Love these travel bags. It holds 16 bottles each. It cushions the bottles very well and packs easily. Great purchase. 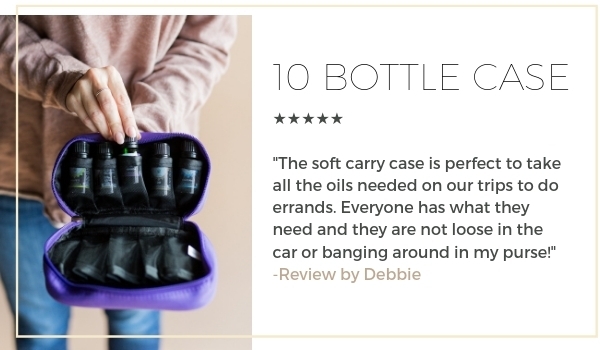 The soft carry case is perfect to take all the oils needed on our trips to do errands. Everyone has what they need and they are not loose in the car or banging around in my purse! This is a great little folio to carry your 'Must have' essential oils with you. Fits 10 Essential Oil bottles perfectly and safely. I purchased the Black color and I'm considering getting a few more!